The Bike According to Roland: "Performance Machine needed a bike to showcase the Contour Wheel and I wanted to build something completely on my own. I bought books and instructional videos on how to bang out metal. Bought a few tools and Todd and I went to work. This is was the very first time we created anything from sheet metal. I drew up the concept and stuck to the design from day one. 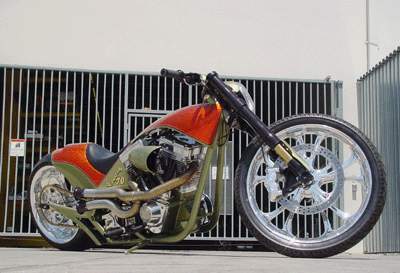 Exhaust system is hand fabbed, triple trees are carved out of huge chunks of aluminum, bars were created from scratch. Very little of the bike is off the shelf."